A comparative essay dealing with two articles covering different aspects of Victorian Crime: the jury system and treatment of juvenile delinquents. Quinault, Roland. “Victorian Juries.” History Today 59, no. 5 (May 2009): 47-53. Shore, Heather. “The Idea of Juvenile Crime in 19th Century England.” History Today 50, no. 6 (June 2000): 21-27. During the nineteenth century, it was not crime that changed in England, but the way that crime was viewed. With the expansion of the middle class and the subsequent ability of the public to care about people beyond their immediate family, the idea of civic responsibility spread and attitudes towards perpetrators and members of the judicial system, both public and official, shifted. As a result of these changes, legislature became more specific and laws not only more plentiful, but more practical and effective. Heather Shore discusses the role of juvenile delinquency in this time of shifting opinion and legislature, making the point that it was not, as many believe, juvenile offenders who changed in Victorian era England nor their treatment, but the legislature and the nomenclature surrounding them. Similarly, juries were affected by the Victorian specificity of legislature, though, according to Roland Quinault, with significantly little benefit gained from the changes, in contrast to the situation of juvenile delinquents. Both the changes to jury laws and legislature governing the treatment of offenders occurred with the same aim—greater specificity, control, and usefulness, though with different degrees of effect. Prior to the nineteenth century, juvenile offenders in England were treated much the same as any other offender: there were no laws for the specific governance of youth or youth punishment, there was no limit on the severity of punishment nor on the cause for punishment. Juvenile delinquents were scarcely even recognized as a separate issue. However, in the nineteenth century, amidst a wave of social reform, the increasing number of juvenile offenders was noted and studied. In her article, Shore sites as one of the results of these studies the discovery that the rise in juvenile delinquency was due, at least inpart, to the “existing system of prison discipline” (Shore, 5)—a circumstance that obviously necessitated change. This, however, was not the only cause for reform in the juvenile justice system. At the time in Europe, a change was taking place in the way that children were viewed; in a trend that was becoming more pronounced, they were treated less as miniature adults and more as the children that they were, creating the beginning of the attitude held towards minors today. This shift in view was due, in part, to the more modern mentality of the Victorians, but also to their increased interest in the new science of psychology, in public affairs, and in humanitarianism that rose up in the nineteenth century. This shift in view was reflected particularly well in the criminal justice system of the time where laws were created to treat solely with convicted children, indicating this separation and illustrating the increased specificity of legislation in Victorian England. Such laws included the eradication of the death penalty for children under the age of fourteen, the institution of summary trials for children under fourteen (an age which was eventually increased to sixteen), the founding of reformatory and industrial schools, the adaption of certain of the hulks for the holding of juvenile offenders only, the eventual elimination of the death penalty for offenders under the age of sixteen, the requirement for prisons to have specific juvenile institutions, and even special prisons created exclusively for juvenile delinquents. These changes were only brought about by the shift in the political climate of nineteenth century England, not by any change in the behavior of juvenile delinquents. Shore stresses this point in her article, maintaining that the only thing that changed about the perpetrators themselves was their numbers, which steadily increased beginning in the 1810’s. It was due to this rise that juvenile crime was brought into the public eye and made the subject of fierce debate, causing old policies to be questioned and done away with in favor of newer, and for the most part, more practical and effective ones. Most legislation implemented in the juvenile justice system during the nineteenth century was surprisingly effective. With the institution of summary trials for children (and informal trials for most girls) court proceedings were sped up considerably, enabling more cases to be treated in a day, an obvious improvement for the judicial system. Also, the establishment of special minors-only hulks and prisons increased the good done by the punishment. Prior to being separated, juvenile offenders were often overlooked and ignored among their adult (and more worrisome) counterparts, while in juvenile centers more attention could be paid to them for correction. In this way, legislation instituted in the juvenile justice system was effective. It was not only the offenders who were effected by newfound specificity of legislation, however. The English jury system was adjusted throughout the nineteenth century, with laws that were, on the whole, not expressly for specification, but simply for improving the functioning of an age-old institution. The English credit themselves with inventing the judicial system, indeed it is the oldest in the world, and, as Quinault points out, it is a perpetual point of pride for the English as a method of “ensuring justice and civil liberties in England” (Quinault, 47). Quinault, however, believes this pride to have been slightly misplaced, for, though the system was sound in theory, in practice, it lacked many things. It was these shortcomings that were addressed in a series of reform acts in the nineteenth century, though unlike the reform made in juvenile justice systems, reform acts such as the 1825 Jury Act seem to have had little outstanding effect. Indeed, the only major change made in the nineteenth century to the English jury system was the lowering of property requirements for common jurors. Common jurors were chosen from among men aged between 21 and 60 and in possession of a “£10 annual freehold tenure or. . . properties assessed for the poor rate at £20” (Quinault, 49). These qualifications were low enough to allow many more than had been allowed before to serve on juries (men of little education in most cases), but still not open up the job of juryman to any man in the country. This law changed the type of man who sat on a jury and subsequently the verdict, as different backgrounds could lead to different viewpoints on matters. Similarly, the 1835 Tamworth Manifesto of Robert Peel introduced balloting for the selection of jurors, specifically addressing the issue of allegations of jury-packing. This law and the previous one are also an example of the increased specificity of Victorian law, in the same way that those discussed by Shore in the area of juvenile crime were. Public reaction to changes in these two fields of juries and juvenile crime were very different. In most cases, the new laws governing the treatment of juvenile offenders were well-received, mostly as they appeased humanitarians and social reformers through the separation of children from adults, the abolition of the death penalty for those under sixteen, and the institution of reform schools. These were not the only reasons to be pleased with the reforms, though. According to Shore, there had often been panics regarding crime and juvenile delinquency, which were, of course, part of the cause for alteration. People who were worried about crime and delinquency were, in general, appeased by stricter legislation that came in the mid-nineteenth century. By this legislation, more and more juvenile delinquents were apprehended and punished. Shore includes one such case in her article: that of James Leadbeater, an eleven year old boy who, for stealing celery, was sentenced to four days hard labor in Wandsworth Gaol. 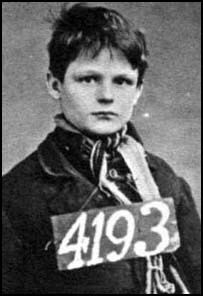 Leadbeater’s picture is shown on the sixth page of Shore’s article, the little boy (who really looks a great deal younger than eleven) with a convict’s placard about his neck with an identification number. This, for those people frightened by the increase in juvenile crime, was happy progress. The more that were apprehended and punished under the stricter laws of the nineteenth century, the better. It would not be true to say that reception for legislative changes to the juvenile justice system were entirely positive, however. 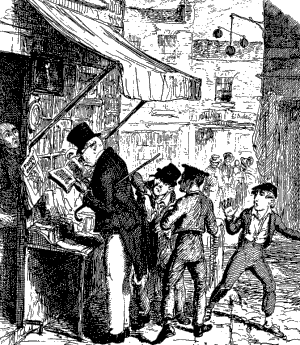 Shore emphasizes that sensationalist media of the time (helped along by the characters of great literature, such as Dickens’s The Artful Dodger) created a stereotypic representation of the juvenile pickpocket of whom the public was to be wary. Helped on by such representations, there were those in the public who wished for juvenile delinquents to receive harsher punishment, or at least punishment equal to their adult counterparts. For these people, the legislation created specifically for children was not a strong enough punishment, nor enough of a deterrent. In the same vein, there were those who believed that education was not the solution to juvenile crime for the problem did not stem from a lack of education, so it followed that education should not solve it. These people advocated for less emphasis to be put on reformatory and industrial schools, and more on deterrents such as hard labor. However, overall legislative changes made to the juvenile justice system were, according to Shore, effective and well received. Contrasting sharply with this is the public reception of changes made in the judicial system. As mentioned above, the judicial system was a point of pride for the English, though merely in ideals and seldom in practice. Quinault makes the statement that, with only a few notable exceptions, juries were, for the most part, a source of ridicule, sometimes of a sympathetic nature. Charles Dickens mocked them in his The Pickwick Papers and they were the subject of many political cartoons of the period, one of which is shown on page 50 of Quinault’s article where the ceremony and traditions of law and the jury are sneered at by the artist. This situation was not improved upon by many of the changes made in the nineteenth century which increasingly put jurymen in awkward or unpleasant situations or even gave cause to ignore them. Among these was a law preventing jurymen from obtaining food, water, or fire until they had reached a verdict, accompanied by practices such as placing jurymen too far away from the proceedings to hear properly and ignoring jurymen and making them wait in an antechamber before they were needed (both of which it would have been beneficial to ban). Jurymen were also often disliked or mocked because of the verdicts they gave. For instance a jury in Aylesbury to acquit a man of murder for the reason that he had been drunk spawned the phrase: “‘If you have done murder and wish to get clear, take care and be tried in Buckinghamshire’” (Quinault, 51). One very notable exception to this view towards jurymen came in 1833 when, following the death of Constable Culley during a violent police break-up of a union meeting in Clerkenwell, the jury at the coroner’s inquest acquitted his assailant with a verdict of justifiable homicide. Needless to say, this decision was popular with the people and the jurors were honored and presented with a silk banner, shown on page 49 of Quinault’s article. However, such a circumstance was exceedingly rare as Quinault points out, and overall public sentiment towards the jury and changes to laws regarding the jury were not well-received. Of the legislative changes discussed in these two articles, it is the legislative changes made to the juvenile judicial system that were the most effective and, arguably, the most lasting. Said legislation shaped the system of present-day England and paved the way for the first juvenile court of England, which was opened in 1905, following the upheaval of the judicial system in the nineteenth-century. In contrast, the changes made to the jury system during the nineteenth century were, for the most part, small and mostly inconsequential ones, with little or no impact on the greater functioning of the English judicial system. However, both articles are true in illustrating the common theme of increased specification in legislature during the Victorian period.